Exploiting the power of technology in special education to improve educational opportunities for children, youth, and adults with disabilities. 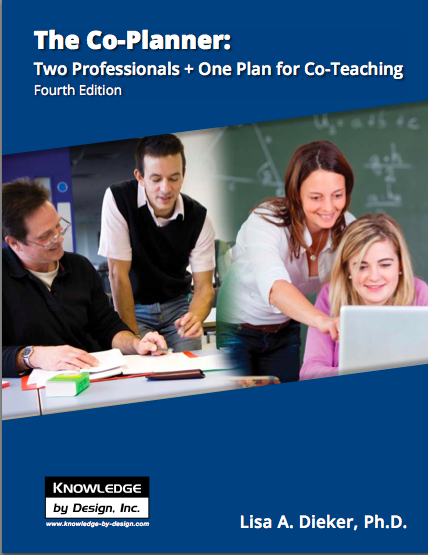 This unique lesson plan book is designed to be completed and shared between a general education teacher and a special education teacher. The fourth edition of this best-selling plan book has been revised and updated to gather evidence of academic and behavioral adaptations as required by IDEA. In addition, planning tools for standard and modified assessment will facilitate efforts to monitor student performance and achievement goals. Includes weekly strategies and monthly notes from the author that offer insight about the value, the art, and the impact of co-teaching. Supports 36-weeks. To order online with a credit card, click on the ADD TO CART button above. Your order will be processed and shipped promptly. We are NOT able to accept or process purchase orders. Copyright © 2019 Knowledge by Design, Inc.